Home » Life in a Day. See how CatDV was at the heart of the workflow of Ridley Scott’s unique feature film. When Oscar winning director, Kevin MacDonald, undertook an innovative new movie project with Hollywood legend, Ridley Scott, he faced a daunting task. 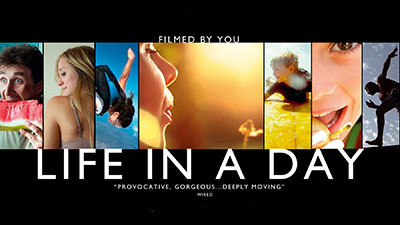 Kevin MacDonald (“One Day in September”, “Touching the Void”) took on the role of creating a full-length feature film depicting the life of the World as experienced in just one day, that of 24th July 2010. This highly ambitious global “first” presented a series of challenges. The media content for the world’s largest ever crowd-sourced film was derived from the global YouTube community; comprising hundreds of video enthusiasts, creative individuals, and novice film makers who uploaded the material via a special portal. The project generated over 5,000 hours of video footage; consisting of 85,000 clips, 60 different frame rates, a multitude of different languages and a wealth of content duplication (e.g. in excess of 1,000 clips of people playing drums). The timescales were tight, with only a few months editing time allowed as the film was to be submitted to the forthcoming Sundance Film Festival. How would the clips be logged? How would the content be classified and sorted? How would the different video formats be standardised for editing? Could this valuable media be archived to enable easy retrieval for future use? The solution came in the form of a dedicated team of 24 multilingual researchers in a London Soho facility, working full time with CatDV – the leading media asset management software from UK-based Square Box Systems. As media was uploaded to YouTube, contributors could enter their own comments with each submission. This metadata was then transferred into CatDV user-fields via XML. During this process, researchers had to standardise the metadata using consistent (English) descriptions and keywords, applying quality ratings and highlighting the best portions of each clip. They also had to reject any offensive or unsuitable content, including inadvertent copyright infringement. As well as allowing the researchers to efficiently review and log the footage as it came in to the CatDV repository, CatDV’s searching and filtering functionality was used to quickly whittle this down to 200 hours of short-listed video for consideration in the next phase. Due to the sheer volume and variety of media and metadata that had to be processed, CatDV’s advanced logging and searching functionality was at the heart of the workflow and key to the success of the project. The website for this unique project has achieved over 37 million hits and the film met with critical acclaim following its UK and US cinematic releases.